The recently constructed Flow Control Laboratory includes a low-speed blower wind tunnel, 180m2 of laboratory space and accommodation for multiple assistants. The tunnel was designed specifically for optical measurements. It is driven by a 75kW blower, has an 8:1 contraction ratio and a top wind speed of 55m/s. Three 0.61×1.0x2.0 meter test sections can be simultaneously or individually attached to the nozzle exit. The tunnel is optimized for optical measurements by employing fully transparent Plexiglas® test sections and novel seeding methods. 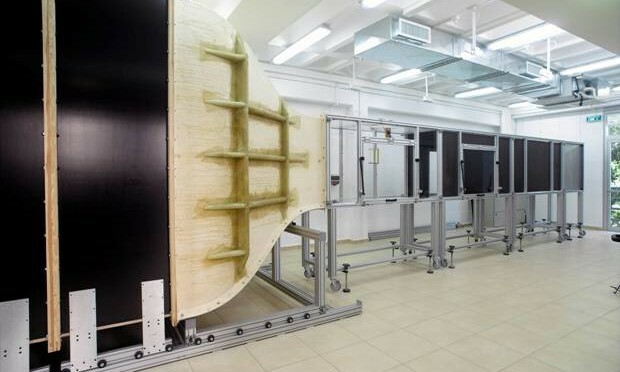 One test section is dedicated to simulating flow conditions experienced by wind turbine blades under conditions of gusts and high levels of turbulence. Measurement equipment includes a 200mJ Stereoscopic particle image velocimetry system, multi-channel hot wire anemometry systems and high-speed pressure measurements systems. Major areas of research include cutting-edge active flow control techniques for maximizing wind turbine power output and extending wind turbine life, increasing the efficiency of industrial fans and compressors, low Reynolds number flows, cavity flows, as well as exploring revolutionary concepts for harvesting wind and ocean-current power.